So your company has finally decided to embrace and leverage the benefits of social collaboration at work. Great! 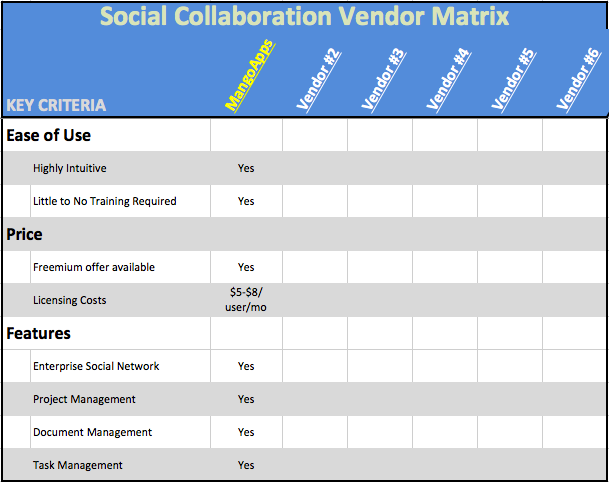 But how exactly do you choose from all of the different social collaboration software vendors? What do you do? Where do you start? Jacob Morgan, author of the Amazon best-seller “The Collaborative Organization,” suggests there are eight critical variables that you should consider when evaluating Intranet or social collaboration software vendors. 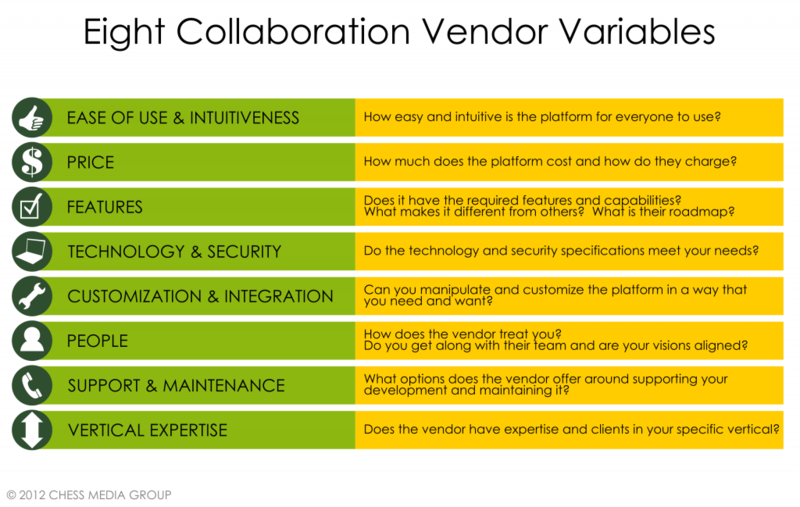 Intranet or social collaboration tool vendors may appear to all be all the same but there are some major differences between the different vendors. Some of these include which deployment options they offer (shared cloud, private cloud and on-premise), their functionality with mobile devices and advanced features and integration. Which vendor is best for your organization depends on your specific needs and also the size of your company. Take a look at our previous posts on the top 5 social collaboration vendors for small/mid-market customers, and the top 5 for large enterprise customers to learn more about which company will work best for you. Once you have identify what’s most important to you, download this template to help as you compare and evaluate intranet and social collaboration software vendors. Use this template to guide your questions, track the answers of each vendor and compare offerings at a glance. The best vendor for your specific needs is likely to jump off the sheet once this template is filled in. If you find more than one vendor fits than you can gather a group of co-workers to test out both options. Most vendors now offer a free plan that allows you to try the service free with no risk. Make sure you know what’s included with each vendor. Some vendor offers are all-inclusive (such as MangoApps and Yammer) meaning that everything is included at one price with no extra add-on fees. Other vendors offer a base price with additional add-on fees for things like MSFT Office and Outlook integrations, mobile access and additional feature modules such as Idea Management. It is also important to understand the licensing model. Does support include all future upgrades, both minor and major? Or will you be required to pay more for new licenses when the vendor’s next major release comes out? You should also ask up front about professional services fees. Some vendors include a certain amount of customization along with your initial license fees. Others charge hourly rates (some > $250/hr) from the start for any customizations or integrations. And some do not allow any customizations at all. The good news is that whatever you choose your efforts will be rewarded. Social collaboration is a significantly more efficient and productive way for workers and teams to communicate. You might just win “employee of the year” for helping bring your company into the social age. As for MangoApps, we make it super easy and completely free for you to evaluate MangoApps and see for yourself if it is a fit with our freemium plan. If you have additional questions or would like more detailed information or walk through of MangoApps just let us know.